Each water purification tablet and folding 1-liter water bag will hold and purify up to 1 liter of water. Survive Outdoors Longer ® Emergency Blanket reflects 90% of radiated body heat and stretched up to 650% without being torn. Fire LiteTM striker is waterproof and tested to produce over 5,000 sparks. Tinder QuikTM burns up to two minutes, even when wet. Bringing back the old school survival tin with the quality and features of a modern survival kit. The Traverse survival kit has you covered in four of the main survival areas; WATER (purification tablet & storage), SHELTER, FIRE, and SIGNALING. The Traverse measures out at 6.25” X 4” X 1.5” and weighs in at a mere 6.1oz. 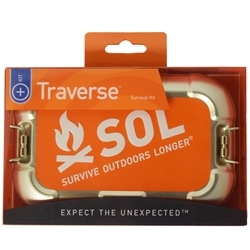 This makes the Traverse survival kit one of the lightest survival tin and is a necessity for your next adventure!